Inflatable stand up paddle boarding is more than just a friendly water sport nowadays; it expanded to be a great means for a full body workout, surfing, recreation, fishing, touring and racing. 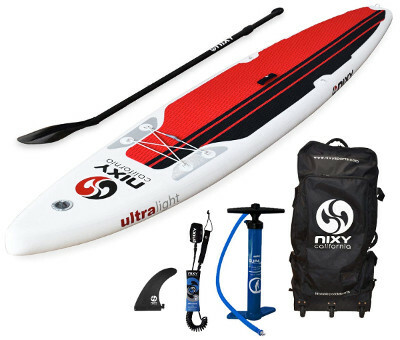 NIXY created a clean iSUP’s line with 3 different boards for different water activities; the Venice for yoga enthusiasts, the Newport All-round for beginners and first-time paddlers, and today in this review we have the Manhattan Touring iSUP which is designed mainly for advanced paddlers who are up to some extra speed with a performance that’s a lot more professional. We tend to make our reviews as direct as possible with all the details you could possibly need to know about an iSUP before making your order. The NIXY Manhattan will be under the spotlight this time and we hope it’ll be what you’re looking for. The Manhattan is NIXY’s largest iSUP with 12 feet and 6 inches in length, 30 inches in width and 6 inches in thickness. It’s super spacious with the ability for experienced riders to put over 300 lbs on board. The length factor is what makes the Manhattan a great touring iSUP with high potential for speed and maneuverability. The pointy nose and sleek body given to it make it super flexible and sharp that you can use it for racing or surfing. As for width, the Manhattan is only 30 inches wide which is different from the Venice (34”) and the Newport (33”) for a reason. Though balance is always an important aspect for iSUPs, the Manhattan is meant for advanced level paddlers who can handle different water conditions with the ability to stay stable while fully controlling the board. Hence, the couple missing inches completely make sense in order to improve tempo and maneuverability. However, thickness remained the same (6”) because it’s crucial that the board, whether it’s a yoga or a touring iSUP, doesn’t bend//flex at the center under your weight. The Manhattan is one of those inflatable standup paddle boards that’ll cause you to turn your head all the way following where it’s heading. It’s large and sharp with great and neat aesthetics to it. 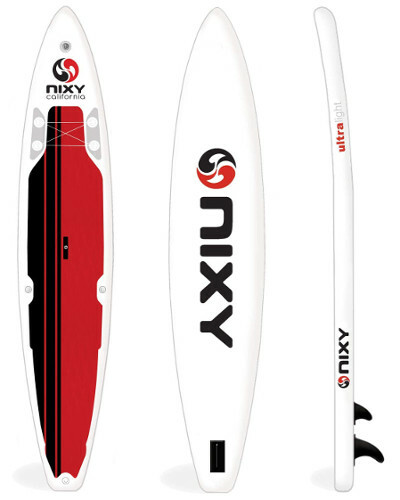 NIXY broke through using the Advanced Fusion Technology to build all of their inflatable SUPs; it’s a technology that makes the board a super tough one using multiple layers of reinforced liquid PVC material that’s fused to the drop-stitch core in order to reach a smooth final result with zero human-errors. Yet, you’ll end up with a light weight board that can be easily carried around by both male and female riders. In addition to that, every detail and feature on the Manhattan is built and glued very carefully to guarantee the perfect high end production look which reflects the minuteness by which all parts were put together. The traction pad. It’s an EVA diamond grooved pad that was machine pressed to the board which directly reinforces its body. It’s perfectly glued so it doesn’t lose shape or come off the board’s back as it nearly covers all of it. The Manhattan is also featured with a front storage area with 4 D-rings and a bungee cord. It comes handy when you need to secure your paddle for a break. Since this board is meant for long distance touring; kayak mode is highly recommended. To enjoy that, you’ll find 2 side D-rings to attach a kayak seat. An additional D-ring for safety leash attachment is also to be found on the board’s tail. Now the navigation system is identical to the one you might find on racing iSUPs. The Manhattan is featured with a single MJK large fin that requires no tools to be attached/detached. Finally, this board comes in two different colors; red and blue and both look super sharp and sporty. To begin with; the Manhattan technically is not suited for entry level paddlers; not because it’s hard to handle but because it’ll take more time for a beginner to pick up this friendly water sport using a sharp iSUP like this one (The Venice will do in this case). The Manhattan is a long distance touring iSUP that can handle speed and different maneuvers quite impressively. It’s length and pointy nose are designed specifically to cut through different water condition in all ease and smoothness. Speed is definitely an aspect here; this board can deliver a very effortless performance using minimum effort to move from one place to another. The sharp fin also works very nicely to ensure straight water tracking and boost the board’s stability. Only a beginner is going to find it a little demanding to have full control over the Manhattan. An experienced user will feel the upgrade NIXY offers from using an all-round iSUP to something larger, sharper and more professional. NIXY offered the same package for all their iSUPs, and that’s something to appreciate about this brand because the package is as good as the board itself. A 3-piece adjustable Aluminum Paddle with a comfortable T-grip and a fiberglass reinforced nylon blade. It’s floatable and it goes from 67” to 82”. A 10’ NIXY hybrid leash with super stretch nylon connectors. A durable NIXY wheeled backpack for easy transportation. The NIXY Manhattan is a super tough and durable iSUP. It can handle more than 300 lbs when used by an advanced level paddler. It comes in a complete, all-inclusive package. It’s great for long distance touring and racing. The design is simple, sharp and outstanding. There is literally nothing that anyone could possibly hate on with the NIXY Manhattan.